Home News Breaking News Are you Doing LinkedIn Right? Are you Doing LinkedIn Right? It is no secret that for most businesses and professionals, LinkedIn is the most effective online networking tool around. Whether you gain the clients, customers and connections you dream of, or you get lost in the crowd, depends on the quality of your profile, network and targeting. A one day seminar on Wednesday, November 21st, is all it takes for you to get the most competent guidance you possibly could. The seminar, organized by Parnassah Network, a division of the Orthodox Jewish Chamber of Commerce, features speakers such as Chaim Shapiro, ME, Director of Office for Student Success, Touro College; David Konigsberg, CEO, Optimal Targeting; Izzy Levovitz, CEO, Profound Business; Ari Zoldan, CEO Quantum Media Group; and Allan Glazer, CEO, Lenbar Consulting. Will you be there? 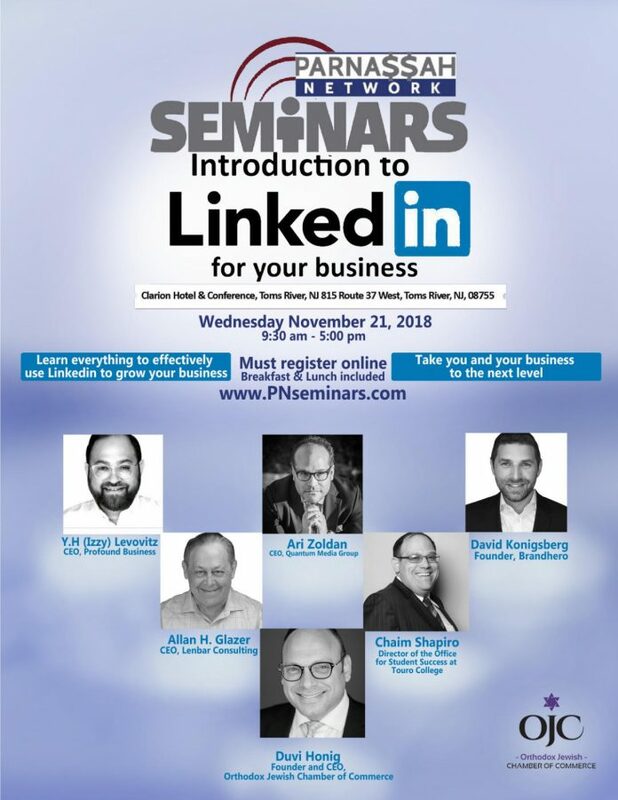 For more information or to RSVP, please visit www.PNseminars.com. Hurry, space is limited. This is great! I always wanted a crash course in using Linkedin better.